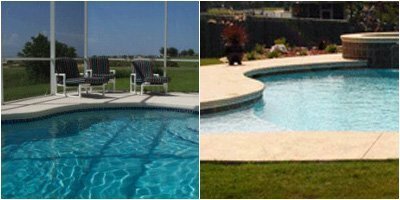 Swimming Pool Deck Coating | Provides Non Slip Surface | Superior Industries, Inc. Vision Kote 99 is a fast-curing, long-lasting, one-part water-based acrylic deck coating. 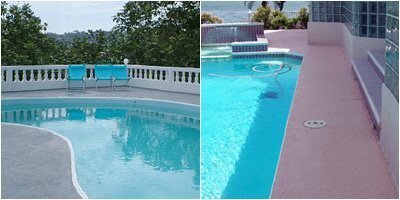 This swimming pool deck coating cures quickly, does not have solvent fumes, and can be applied to bare concrete or painted concrete surfaces. 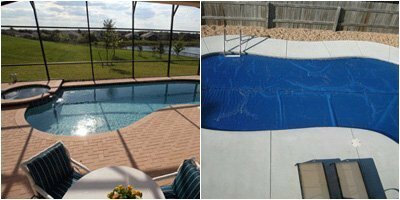 Vision Kote 99 is more than just paint; it actually penetrates the concrete surface and leaves it cooler to the touch, and because it contains an aggregate non-skid additive, it provides some important slip resistance on the pool deck surface. Offering superb color retention and strong resistance to UV rays and weathering, Vision Kote 99 is the coating of choice for finishing and refinishing swimming pool decks. Vision Kote 99 is available in 10 colors: Birch Gray, Sedona Tan, Sand Buff, Adobe Buff, Aztec Gold, Aqua, New England Blue, Rose Pink, Coral Peach, and White. 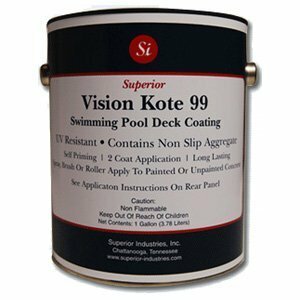 Because you can even apply Vision Kote 99 to damp surfaces, it is excellent for use in high humidity environments where it is nearly impossible to have a completely dry pool deck. This durable acrylic coating is non-flammable and is resistant to chemicals and abrasion. It is able to resist peeling and chipping for years. Vision Kote 99 was formulated to be the best protectant against UV rays, fading, chlorine, algae, alkali, mineral oils, and both fresh and salt water. Available In: Birch Gray, Sedona Tan, Sand Buff, Adobe Buff, Aztec Gold, Aqua, New England Blue, Rose Pink, Coral Peach, and White. Get that fresh pool deck look today by applying one of the many beautiful colors of Vision Kote 99. Each color naturally dries with a flat finish, but if you would prefer a non-slip finish you can add sand, marble dust, or pumice stone to the paint as desired. This acrylic deck coating can be applied on concrete surfaces that are bare or already painted. No primer is needed – Vision Kote 99 is a self priming paint. Vision Kote 99 can be expected to cover 300-400 square feet per gallon, and two coats will be needed for proper application. Cleaning up after applying Vision Kote 99 is a breeze – it simply involves using soap and water. Vision Kote 99 is available in both 2 gallon cases (2 each, 1 gallon) and 5 gallon containers. This decorative swimming pool deck coating is dry to the touch in 30 minutes (at 75°F, 24°C) and can be re-coated after 4 hours if desired. Vision Kote 99 only requires 2 days to completely cure before your pool area is up and running once more. It offers a coverage range of 300-400 sq ft (at 2 mils dry) and its recommended thickness is 4 mils dry, so 2 full coats will be required. Note that 50% less coverage results from use on rough, bare, or sandblasted surfaces. 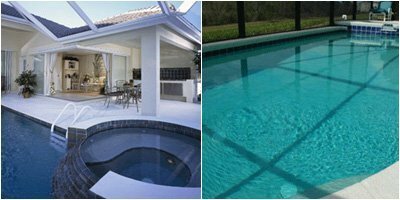 If you’re trying to figure out how much paint your pool deck job will require, here’s a helpful equation: Length x Width x 1.7 = square footage x 2 (2 coats) / 300 square feet = gallons of paint needed. Instructions: Proper surface preparation is very important to the successful application of Vision Kote 99. We recommend that you read the product label carefully before you begin the application process. Before applying this acrylic swimming pool deck coating, mix it mechanically for 10 minutes and apply straight from container, thinning with water as needed for optimal performance. To apply, simply spray, brush, or roll on. When rolling (which is the preferred application form), use a 3/8” nap mohair, metal, lambskin, or phenolic core roller. Keep the roller wet and roll in one direction, rewet it, then cross roll. When spraying, use a conventional air sprayer (50-70 psi, tip size .055-.070) or an airless sprayer (2200-2500 psi, tip size .019-.023). Do not apply Vision Kote 99 if substrate, material, or ambient temperature is not between 50°F (10°C) and 95°F (35°C).